Two parallel bands, one with an S-shape embroidered in yellow pulled work in diagonal rows, with dark blue double running stitch outlines and stylized plants in fine darning stitch. 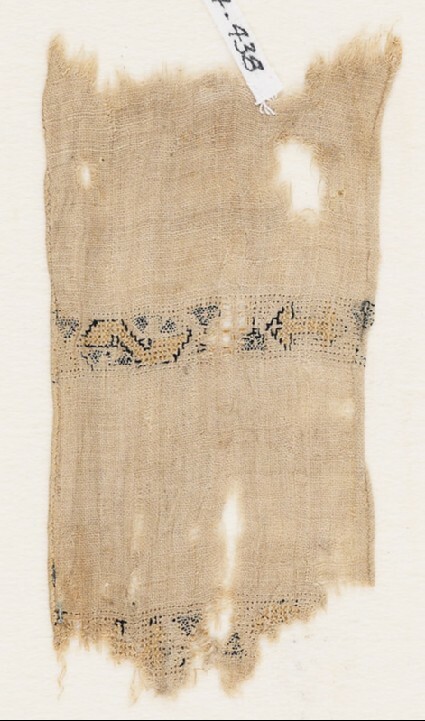 Between these two motifs are remains of very fine drawn-thread work with needle-woven bars. The design of the second band is largely disintegrated. The first band is 1.5 cm wide; the two bands are set at right angles between the textile's two edges, both with a rolled hem. One hem is whipped with silk, the other with a 2-ply flax thread.